The connection between the month of February and African American history is a well-established tradition throughout the country. But few Washingtonians probably know that it had its start nearly a hundred years ago here in the District – at 1538 9th Street in Shaw, to be exact. 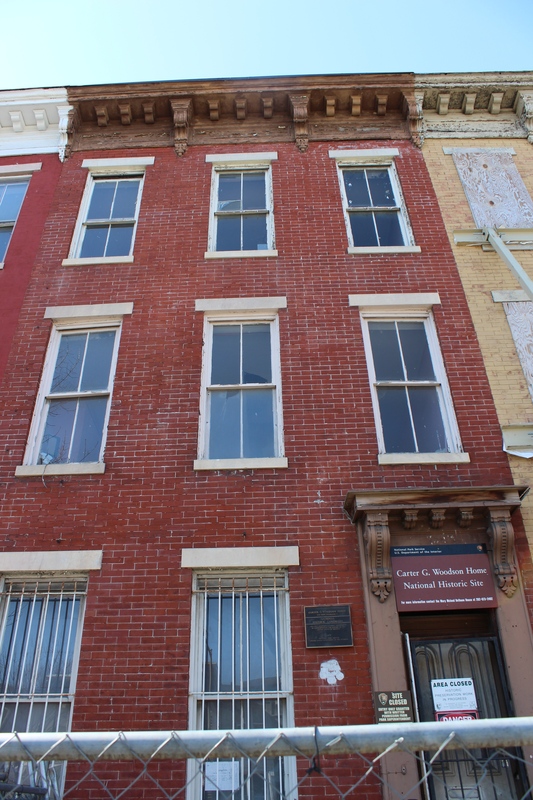 In this unassuming row house, Woodson researched, wrote, and published some of the most important works of African American scholarship in the beginning of the Twentieth Century. This week, three of my favorite things were combined into one evening: local D.C. lore, great craft beer, and an historic house tour. That’s the premise behind the Heurich House Museum’s monthly History & Hops event – and seriously, what could be better? It brings together local brewers (happily a growing breed in the District) and the Brewmaster’s Castle – the museum and mansion that was home to Washington, D.C.’s most successful brewer, Christian Heurich (pronounced HI-Rick). The house has been an iconic place for me since I moved to D.C. Located just off Dupont Circle on New Hampshire Ave, you can’t miss it’s odd shape, Old World architecture, and imposing stone turret. It’s instantly recognizable to Washingtonians, even though most would be hard-pressed to tell you the history behind it. Luckily it’s a fun tale, best told over a cold brew. 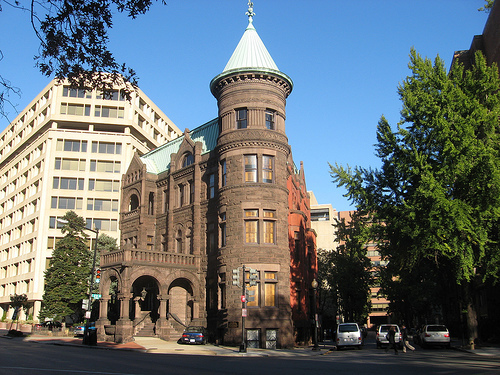 Christian Heurich’s Dupont Circle mansion, also known as the Brewmaster’s Castle. It’s the Dog Days of Summer. If you’ve stayed behind in Washington (What are you doing here?? Even Congress flees town in the month of August…) or if you’re visiting the nation’s capital, sometimes the only thing to relieve the heat is a tall, cold drink. Luckily you can stay cool and experience D.C. history by drinking a Rickey – Washington’s native cocktail. It’s been described as air conditioning in a glass, which explains why July has been designated as “Rickey Month” in the District. I would lobby to add August, too. 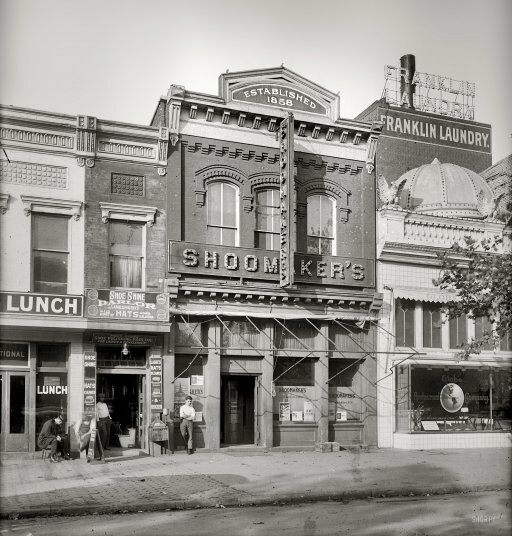 And it’s perfectly fitting that a lobbyist is credited with the creation of D.C.’s indigenous cocktail – “Colonel” Joe Rickey, an influential and colorful Democratic lobbyist from Missouri who owned the famous Shoomaker’s Bar. This weekend in D.C. had a decidedly French flavor, and that’s before I even realized that today was Bastille Day. On Saturday I visited the Society of the Cincinnati, an organization founded at the close of the Revolutionary War by French and American officers to preserve the bonds forged during that long struggle. George Washington, the general who helped unify the Continental Army and the colonies, served as its first president. Among its ranks, there were two founding French members who would be well known to future Washingtonians – the Marquis de Lafayette and Pierre Charles L’Enfant. 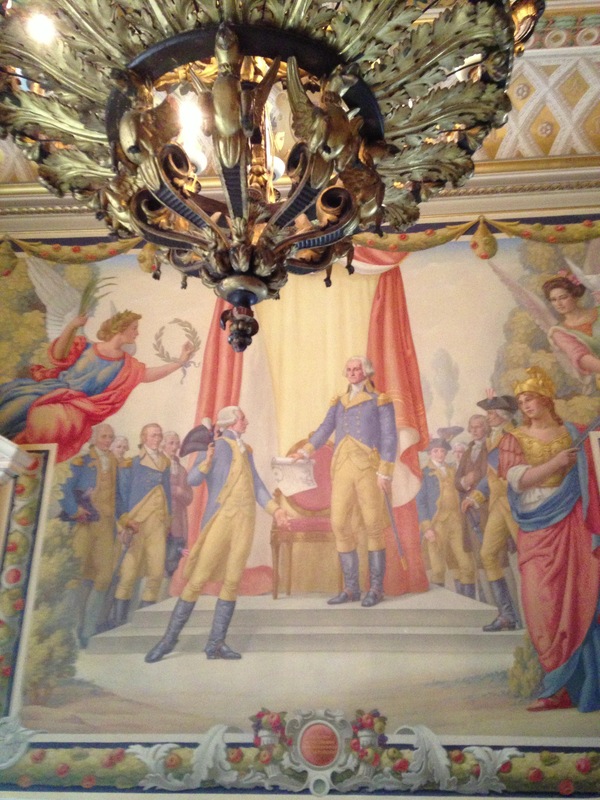 A mural in sumptuous Anderson House showing Washington and Lafayette and the founding of the Society of the Cincinnati. Lafayette was the young French aristocrat who ending up playing a key role in both the American and French Revolutions, and whose name and statue grace the park on the north side of the White House. And L’Enfant of course was the talented but difficult engineer and artist who served General Washington during the war, and was later selected by him during peacetime to design our first capitol – Federal Hall in New York City – and then the capital, the District of Columbia. Some Washingtonians have been a part of the District and its institutions for so long that they become living history. This week Washington said Aloha to the second longest serving Senator in American history – Daniel Inouye. Senator Inouye passed away on Monday at Walter Reed Medical Center at the age of 88. He had represented Hawaii in Congress since 1959, the same year Hawaii became a state. He was a decorated World War II combat veteran, Representative, Senator, and third in line to the Presidency. And today, members of Congress paid tribute to him as he lay in state in the Capitol’s Rotunda, a rare honor for any politician. You can pay your own tribute to this longtime Washingtonian at one of the city’s interesting but often overlooked memorials – the Japanese American Memorial to Patriotism During World War II. There was a great op-ed in the New York Times today explaining the historical peculiarities of why the District doesn’t have a vote in Congress – effectively creating taxation without representation in the nation’s capital. It seems strange that a city so consumed with politics – and with a population greater than the state of Wyoming – didn’t get the opportunity to vote for president until the election of 1964. Over the weekend, I discovered a new connection between butterflies and the District – in addition to the Butterfly Pavilion at the Natural History Museum. I was at a matinee of the opera Madama Butterfly on Sunday, performed by the Washington National Opera at the Kennedy Center. 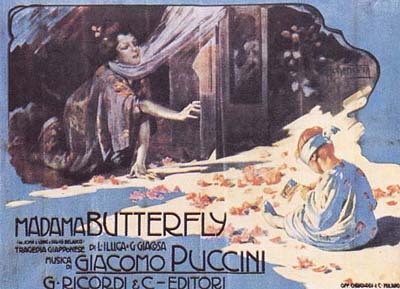 An original poster from an early production of Madama Butterfly. The performance was great, and it made me nostalgic for the couple of years I spent living in Japan. It’s set in the city of Nagasaki, which was just a few hours away from the small town where I lived on the island of Kyushu. standing in Nagasaki, whose Scottish owner married a Japanese woman and was said to have inspired the short story Madame Butterfly. It was later turned into a play, and finally the opera by Italian composer Giacomo Puccini.